Know if the fish are biting before you go to your favorite fishing hole from your phone or watch! My Fishing Forecast takes the guess work out of interpreting weather patterns and solunar events impact on fish activity by providing you with a simple up-to-the-minute fishing condition rating for your EXACT location and point in time over a period of the next 5 days. 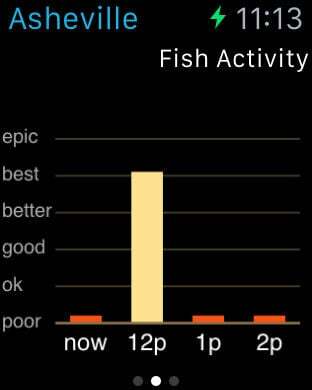 My Fishing Forecast is the only "best fishing times" tool to combine solunar events, weather trends, and astrological data into a single easy to read rating. No need to have an advanced degree or personal understanding of the advanced scientific processes that power it, the app interprets the data and provides an hourly breakdown for you with a simple rating ranging from Poor to Epic. 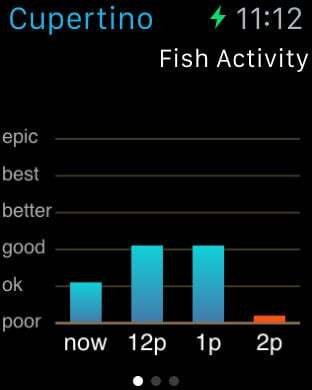 You can simply sit back, let the app do the all the statistical analysis for you and just fish!